I had an interest in technology from a young age and believed that Computer Science would allow me to understand more about tech and learn the skills I would need to join the tech world. Brighton is also known as UK’s next digital tech hub and this can be seen by the various small business and start-ups within the area. This makes having the University of Brighton on my CV much more valuable for employers. I would highly recommend Computer Science to anyone considering it. There is a good mix of modules within the course (mostly technical) but you will have a few modules throughout the degree which will teach you how businesses may apply these principles. The course is quite flexible as you will have the opportunity to pick some modules for your second year and third year. The benefit to this is that you can model your degree to what suits your skillset as well as your interests, so you do things that you want to do. The teaching at Brighton is structured so that you are not treated as a child; it’s not a ‘you listen, I talk’ relationship with the lecturers. Typical lectures are discussion based and interactive, not just taught content. Lecturers are very helpful and have high availability, even during busy periods. The pastoral care from the SU and even lecturers is amazing at Brighton with everyone just wanting to help in whatever way they can to make your life easier and University experience better. Undertaking a placement year was probably the biggest highlight (I highly suggest first and second year students to apply). I had the chance to work at Xerox as a Web Developer/Business Analyst. The role gave me a huge amount of experience and independence and taught me so much more than I thought it would. 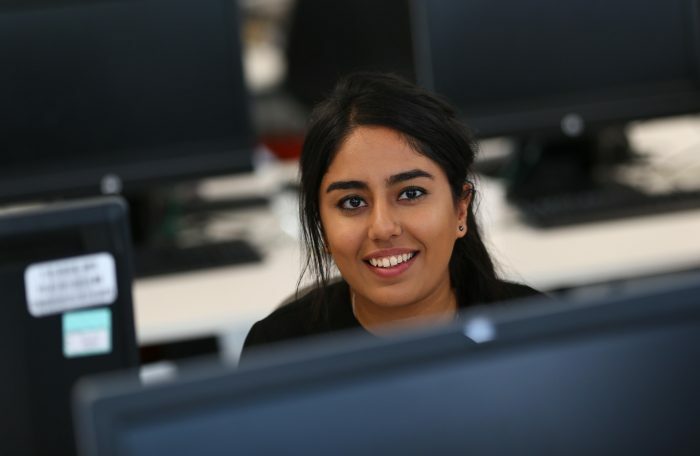 Being in the workplace really made me value and understand how my degree will help me within industry and gaining an insight into where I want my career to go whilst still being at university was so helpful! With persistence and a little a bit of luck, I also got a summer internship which was just as valuable and opened so many more doors for me. On my placement year, I worked in a global reporting team where I worked with internal stakeholders to carry out analytics on data for financial and service reporting, as well as create solutions to improve efficiency within the business. I worked with teams across Europe, North America and Asia to create solutions that allowed different teams to have access to data whenever they needed. I was responsible for creating reports on a daily, weekly, monthly and quarterly basis using systems such as SAP and other business-specific reporting suites. One of the hardest things about going on placement year is learning how to apply yourself efficiently within a short amount of time. I was given responsibility from the first day, and it was not like any kind of work experience I’d ever had before – there was no filing or making of tea going on! You have a large skillset behind you from two years of university study, and I quickly learnt that the way you’re taught to do something theoretically, when in a practical environment, you just don’t have the time or resources to do it. Having said that, trying to figure out a new way of doing something using your studies as inspiration was one of the most interesting things. You realise how quickly the modules you have studied come together and complement each other to help produce a successful outcome. I used my web development skills which I learned in my first year for my placement. The basic programming concepts taught on web development provided a good foundation for when I arrived at Xerox, as well as the project management skills such as requirements gathering and planning that came from other modules. After graduating this summer, I will be joining Morgan Stanley on their Technology Analyst (Graduate) Programme in London. The experience gained whilst on placement year and my summer internship combined with my university studies have allowed me to secure a position at one of the largest global investment banks, and I will be taking all that I have learnt onwards into this position. My final year project was to detect abuse and trolling within social media by using Sentiment Analysis and Natural Language Processing. I researched into the different ways of implementing text mining and used machine learning to create a web application that allowed users to input text and determine whether their input would likely to be perceived as abusive. I used datasets from the microblogging site, Twitter, to carry out my analysis and research. I enjoyed the freedom of being able to research a topic of my choice and implement and develop an application using technologies of my choice. I learnt a lot about the area and have a new-found appreciation for those who dedicate their time to R&D, both academically and within industry! The advice I would give to someone who is thinking of applying for this course at Brigthon is to make the most of every opportunity available to you and use the various support systems around you. Put yourself out there and begin networking as early as you can! (Sometimes, the best opportunities come from places and people you least expect!). This entry was posted in Computer science, Life at Brighton, Placements, Student Work, Uncategorized, Undergraduate.